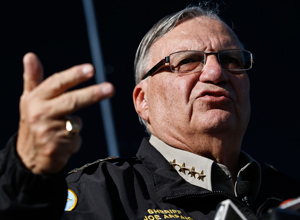 The National Hispanic Women's Conference told Maricopa County Sheriff Joe Arpaio this week that he is not wanted when the Phoenix Convention Center hosts the event this week. America's self-proclaimed toughest sheriff has been told to stay away from a national Latina conference when it comes to Phoenix. Organizers with the National Hispanic Women's Conference told Maricopa County Sheriff Joe Arpaio this week that he is not wanted when the Phoenix Convention Center hosts the event. The conference, which is expected to attract hundreds across the country, begins Thursday. The group also denied a booth to the Maricopa County Sheriff's Office to recruit potential new employees and returned an $800 entry fee. In a statement, the group says its decision was based on a recent court ruling that for years MCSO engaged in racial profiling against Latinos. "The conference is about leading and inspiring Latina professionals," said Leticia de la Vara, a spokeswoman for the event. "Arpaio does not fit that mold, so it was a pretty easy decision on why we would go forward with that." De la Vara added that if Arpaio is trying to mend fences with the Hispanic community their convention isn't the place to do it. "He has built quite a big wall between us and his office because of the raids and the path he's taken to approach how he's going to work with the Hispanic community," de la Vara stated. Arpaio says he didn't think it was fair for the group to take out its dislike of him on his employees. He says 24 percent of his office is Latino. "I have been reaching out more or less to the Hispanic community and I am a little discouraged that this lady turned me down, sent the check back, because she thinks I am too high profile when you are dealing with the Hispanic community," Arpaio told KSAZ-TV. U.S. District Judge Murray Snow ruled earlier this year that Arpaio's office systematically singled out Latinos in its immigration patrols and deputies unreasonably prolonged the detentions of people who were pulled over.